We keep a history of all services performed, and you can be notified when your fleet vehicles need additional owner’s manual recommended maintenance services. Extend the life of your fleet vehicles, increase the productivity and safety of your drivers, and keep the wheels of your business turning with our fleet services. 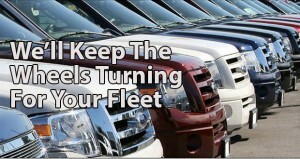 For information on setting up a Fleet Service Program, contact us at 970-513-0292. About 2 years ago I changed over from having my car serviced by the local dealer to SAG. They are awesome! We also accept cash and check.